SUBHEAD: Part 3 of The Cosmos, the Earth, and Your Health – The Story of Soil. Image above: Healthy soil can't help but support life. Photo by Jack the Lizard. From (http://www.animal-dino.com/story_of_soil.html). In the first two episodes of this series on how soil is formed, we’ve been operating at the cosmic level, talking about the how the elements of life were molded during the Big Bang, inside stars, and in explosive supernovae. It’s time to come back to earth, and to reverse scales from the mind-bogglingly large to the infinitesimally small. When we left our story, the main actors had taken their places on stage; the elements critical for life had formed. Now, as we wait for the curtain to rise, we can look at the playbill to see who these characters are and why they are so beautifully suited for their roles in creating life and building soil. The first category is a batch that chemists call “main-group elements” because how they cluster in a large group in the periodic table. The main-group elements involved in soil include carbon, nitrogen, potassium, phosphorus, calcium, magnesium, and sulfur. These are, obviously, major players in story of soil, and copious amounts of all of them get cycled around by living things. A second group of elements are less abundant in life, but are every bit as crucial in living processes because of their hyperactive, social-butterfly qualities. They are members of a group that chemists call “transition metals.” That word “transition” hints at the shape-shifting nature of their character that makes them so dynamic and able to play multiple roles in living things. They include iron, nickel, copper, zinc, manganese, cobalt, and molybdenum. There are many more transition metals, but those seven are the most common and the ones whose roles in life we know best. I’ll give you some brief biographies of the major players to show what role they fill in life and likewise in soil. Carbon, that’s a word that’s constantly in the news these days, and often not in a good way. But carbon has been at the center of events long before the fossil-fuel era. It’s hard to conceive of life that isn’t based on carbon. That’s because it is uniquely multi-functional among all the elements. 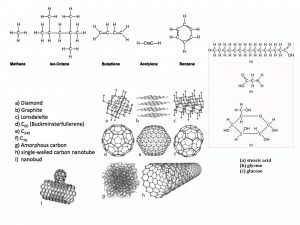 It comes in several forms; soft graphite, hard diamond, soot, and nanotech inspiring fullerenes are each pure carbon, and each has wildly different qualities from the others. Carbon can construct nearly 10 million known compounds, vastly more than any other element. And although a few other elements can bond to one or maybe two others of its kind, only carbon can build chains of itself. When it combines with hydrogen, its most common partner, it forms a tetrahedron, and any Bucky Fuller fans out there know that tetrahedra have almost magical properties. Water, another molecule with unexpected qualities, also forms a tetrahedron, and that’s food for thought. Carbon is immensely changeable, depending on what it is linked to. When hydrogen is its principal partner, it forms hydrocarbons. These are liquids such as gasoline, oils and tars, and solids such as plastic. When oxygen is added to the carbon-hydrogen pairing, the result is gums, waxes, fats, sugars, and other gooey substances that we associate with life. 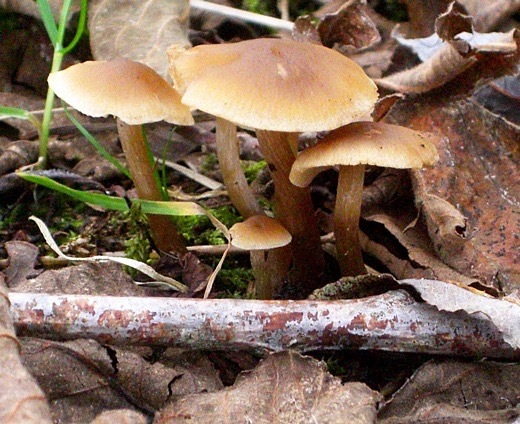 Adding nitrogen yields dyes, amino acids, and alkaloids such as caffeine and psilocybin. Add sulfur, and antibiotics result. Blend in phosphorus and we get DNA and a crucial energy-carrier called ATP. It’s ability to form innumerable compounds is one reason that carbon plays such a big role in life, but there’s another reason just as powerful: It can store lots of energy when it bonds to itself, and then release that energy when those bonds break. It’s that energy that makes carbon in soil, in the form of organic matter, so important. Just as we do, soil life such as microbes and insects need a constant supply of carbon compounds for their easily available energy. When the enzymes and acids within living things break carbon bonds, the energy released is transferred to compounds in the organism such as ATP and sugar, moved to places that it is needed, and released again to power more molecule building and unbuilding. That’s most of what metabolism is: the transfer of energy from carbon compounds, otherwise known as food, from one place to another, to do various important tasks via other carbon compounds such as proteins, DNA, and vitamins that are especially suited to those tasks. 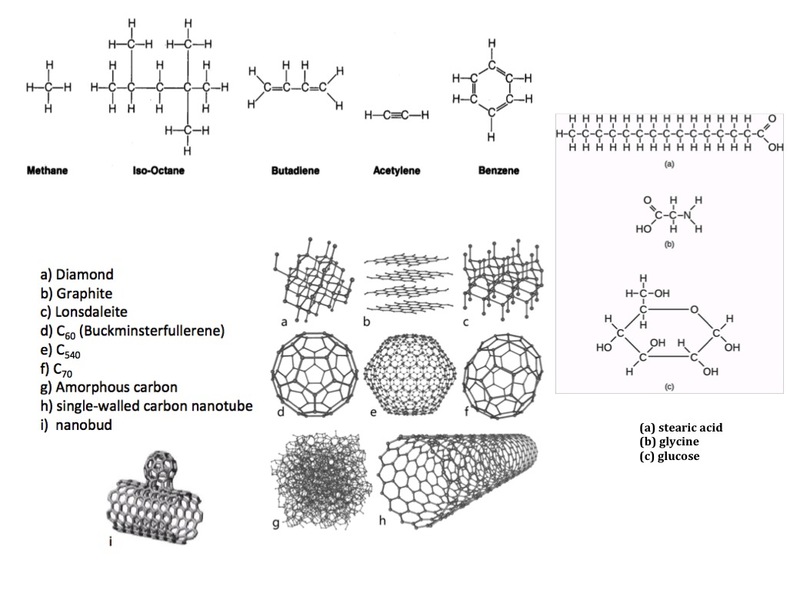 Image above: Some of the many forms of carbon. Even if you can’t read chemical structures, you can see that the patterns that carbon creates are many and varied. From original article. I could write a book on the marvels of carbon (and may some day!) but before carbon’s nuggetized biography takes over this whole article, I will sum up by saying that carbon’s ability to store and move energy, and also to bond with so many other elements and thus shuttle them from place to place, make this element the backbone of life. Soil lacking in carbon—in organic matter and the soil life it breeds—is dead soil, and it creates dead food. Nitrogen is a much-touted soil nutrient, critical but often so over-emphasized that other nutrients just as valuable get overlooked. It’s needed to build protein, which is found in structural tissues such as muscle and cell membranes, and also in enzymes, active, flexible chains of molecules that are the construction equipment of life. Enzymes weld together protein, starch, and DNA chains; push needed molecules through cell membranes; repair and regulate DNA, and do essentially all the building, transport, and disassembly that go on within living things. Every living being needs nitrogen to keep protein in good supply. Nitrogen is also a major ingredient in chlorophyll, the compound that uses sunlight to build sugar out of carbon dioxide in the air. That’s why plants green up so fast when they get a dose of nitrogen. Too much nitrogen can prompt insect damage, because bugs need lots of it and can “smell” when plants have it in overabundance. Phosphorus stimulates root formation, improves flowering and seed production, strengthens stems and stalks, aids nitrogen-fixing bacteria, and increases disease resistance. It’s used in DNA, special fats that make up cell membranes, and in ATP, which is a principal energy-storing molecule. Phosphorus is stored in large amounts in seeds as phytin, where it can by used by the developing seedling. Phosphorus also aids in transporting other nutrients around the cell. Some scientists and activists believe we’re rapidly depleting phosphorus supplies and feel that we need to be much better at stewarding it. Potassium has a role that is less understood, but it is needed for many enzymes to function, and it helps young plants get started, in part by strengthening roots. Potassium-deficient plants are more susceptible to cold, extreme heat, drought, insect predation, and disease. Calcium is a neglected nutrient that is just beginning to get its due. The textbooks will tell you that calcium is needed in modest amounts to build cell walls, protect against heat stress and disease, aid in nitrogen fixation by bacteria, improve fruit quality, and help in the uptake of other nutrients. That last role conceals a mountain of important and often dismissed functions for calcium. Maverick soil scientist Dr. William Albrecht was among the first to sniff out calcium’s unsung role in soil biology, nutrition and health, and his work spawned a school of advocates, including the Acres USA publishing team, and soil specialists such as Michael Astera and Steve Solomon. I recommend checking out their work for an expanded and radical view of soil minerals that has helped me immensely in growing nutrient-dense food. For example, agricultural lime (calcium hydroxide) has been used for millennia to make acidic soils sweeter, that is, to raise their pH. But Albrecht found evidence that it’s the calcium in lime that reverses the nutrient deficiencies that common wisdom claims are due to acid pH. In other words, when soil contains enough calcium, soil acidity matters much less. This is, to put it mildly, controversial, but a view that some serious plant growers swear by. 15% magnesium, 4% potassium, and 1-3% each of the others. For more on these ratios and the thinking behind them, check out http://soilminerals.com and Michael Astera’s book The Ideal Soil. For an opposing view, see what soil scientist Neal Menzies has to say. My personal view, and the one that guides my fertilizer recipes, is that most soils benefit from adding more calcium than the conventional guides say, but there is a lot of leeway in the ratio of calcium to other nutrients. I don’t worry about achieving a perfect 65/15/3 balance, just something in the ballpark, or even in the same part of town. Magnesium is at the center of the chlorophyll molecule, just as iron is at the heart of the very similar hemoglobin molecule in mammals. It’s essential for ferrying phosphorus and iron to where they are needed. Many of the enzymes that synthesize sugar, fats, and oils contain magnesium. In soil, it increases the stickiness of some clays, so levels that are too high can make soils gummy and even anaerobic. In soils low in clay, adding magnesium sometimes helps soil hold more water and stabilizes organic matter. To wrap up this segment of our series on soil: Carbon builds structure and stores energy. It’s not properly a nutrient, but its presence in soil in many forms is critical for ecosystem function and everyone’s health. The elements that make up what soil folk call the primary nutrients are nitrogen, phosphorus, and potassium. Those three are, I think, overemphasized, a legacy of some of the earliest experiments done on plant nutrition that used anything resembling the scientific method. Justus von Liebig, a brilliant German chemist who made major contributions to organic chemistry and invented important chemical equipment, examined the content of ashes from grains. He found principally nitrogen, phosphorus, and potassium, and since then generations of farmers and soil scientists have concentrated on—and used staggering quantities of—these and only these as nutrients. The roles of carbon and of the other mineral nutrients were neglected for over a century, leading to depletion of most of the world’s farmable soil and a precipitous decline in nutrition in our food. The secondary nutrients, calcium and magnesium, are only secondary in sheer mass required, but not in importance to plant, soil, animal, and human health. The same goes for the trace elements. Chalk up another victory for the “quantity over quality” mindset, and a loss for all of life. I’ve used more words than I expected to get to this point in our tale. We haven’t made it to the trace elements and why those transition metals are so magical and important—so important that some scientists joke that life arose simply as a way to move them around. We’ll talk about that next time, and begin looking at how to tailor your soil to yield lush amounts of nutrient-dense food: both quantity and quality. • Toby Hemenway is the author of Gaia’s Garden: A Guide to Home-Scale Permaculture, which was awarded the Nautilus Gold Medal in 2011, was named by the Washington Post as one of the ten best gardening books of 2010, and is the best-selling permaculture book in the world. His new book on urban permaculture, The Permaculture City, was released in July, 2015.